“I am very grateful to Pump Aid for coming to our rescue. I am a living testimony of how my family life has changed because now I can access safe water from within my doorstep.” Angelina Chagwa explains. 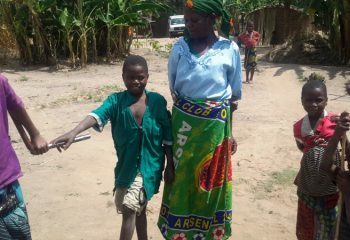 The people of Andulu village used to walk about 3 km to collect water from a hand pump. When they dug the well in their community, they used a rope and bucket to draw water which was not safe for drinking. This was before Pump Aid through its discussions with the District Executive Committee and the Area Development Committee selected their village to be assisted with an elephant pump supported by the Charles Hayward Foundation. The fund helped Pump Aid mobilise the community in Andulu village to participate in the deepening of their open well and lined it ready for protection. Pump Aid with its technical team built an elephant pump which the community now uses to collect safe water from within few minutes distance from the furthest household in the village. Angelina Chagwa is from one of the female headed households in Andulu who has benefited from this project. A mother of 7 with three grandchildren, Angelina and her children used to walk long distances to fetch water often coming back too late for her children to go to school. “It was difficult for my children,” She explains. “They often went late to school and got punished by their teachers which led to them opting to drop out from school,” she continues. Asked on what problems she used to have before Pump Aid supported them with the elephant pump, Angelina explains, “It was difficult, sometimes we would fight for water at the water point. I remember they even broke my container one day because everyone wants to be the first to collect water. Currently Angelina says her remaining children are able to go to school and she is able to fetch food for them without many problems because she has extra time. Her grandchildren have all improved their grades, thanks to the time they have to go to school early and not spend time doing some punishments. “My grandson Fyucha here came 6th in his class last term improving from position 14 in his first term. Last year in standard 2 class before we had this water system, he got position 33. Asking Fyucha (literally meaning future in English) why he is able to improve his grades at school, he rather explains shyly, “my granny lets me go to school early and I concentrate because I am no longer worried that I will have to do heavy jobs like fetching water when I get back home.” Fyucha Dausi is a standard 3 pupil at Nanjiwa School. 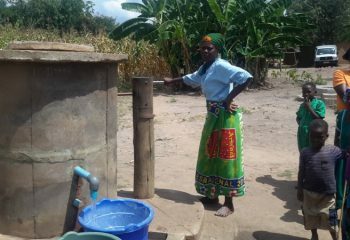 Andulu village pump is one of the five Elephant Pumps built by Pump Aid with assistance from the Charles Hayward fund. The fund was designed to meet the needs of vulnerable people in selected villages in TA Mavwere in Mchinji district in Malawi.